The latest climate summary for 2017 was just issued by the Southeast Regional Climate Center. You can access it at http://sercc.com/climateinfo_files/monthly/southeast_monthly_report/southeast20171_12.pdf. 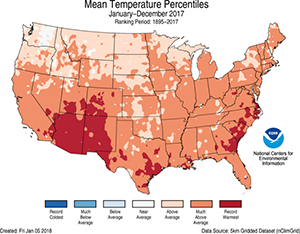 The latest summary of climate conditions for the Southeast is now available from the Southeast Regional Climate Center. You can read it at http://sercc.com/climateinfo_files/monthly/southeast_monthly_report/southeast201712.pdf. 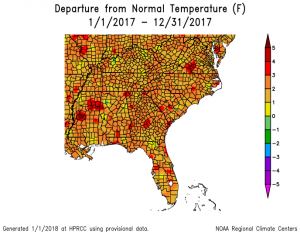 The latest monthly climate summaries for December 2017 for Florida and North Carolina are now available online. 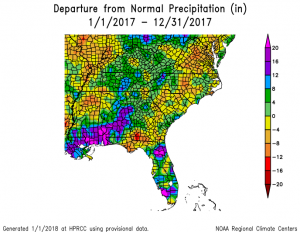 You can view the Florida one at https://climatecenter.fsu.edu/products-services/summaries?id=517 and the North Carolina one at http://climate.ncsu.edu/climateblog?id=250&h=5666e5c1. 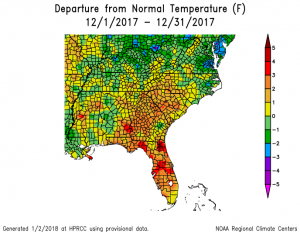 Molly Samuel of WABE Public Radio posted a nice summary story on Georgia’s 2017 climate, featuring quotes from Bill Murphey, the State Climatologist, and Jordan McLeod, the regional climatologist at the Southeast Regional Climate Center and a UGA graduate. 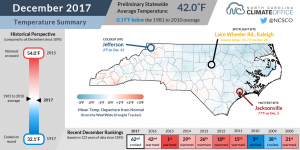 You can read and listen to the story at https://www.wabe.org/2017-warm-extreme-year-georgia-weather/.